All Halkon Hunt GORE-TEX Garments have a GUARANTEED TO KEEP YOU DRY promise, to help us deliver the best possible customer service and aftercare. We are proud to deliver this promise at Halkon Hunt. 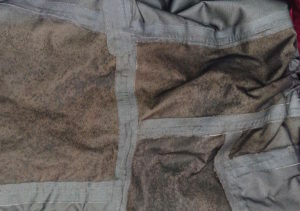 If you feel your GORE-TEX is leaking and not performing as it should, your garment must be returned to us for evaluation and will be repaired or replaced at our discretion. Once we have inspected your clothing, we will contact you. Any Manufacturing defects such as zip repairs, Velcro, and stitching, will be repaired free of charge up to 2 years, proof of purchase will be required. Any repairs required after this time frame, caused by the user, or without proof of purchase will be charged at approximately £30 per hour + VAT and delivery back. Make sure you include a covering letter in with your clothing, we would need a name, contact telephone number, a delivery address, and also a brief note of why you have sent the clothing in to us, please include as much information as possible. 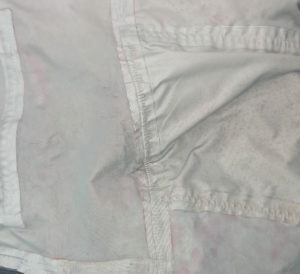 Before sending any clothing in to Halkon Hunt for repair or returns, please ensure the items are clean and dry. 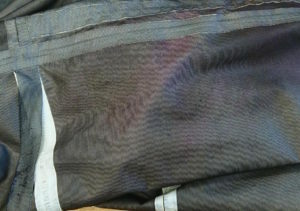 Any clothing received in a non-serviceable condition will be returned or charged a fee for laundering. Please do not pack any clothing for posting while the items are still wet! 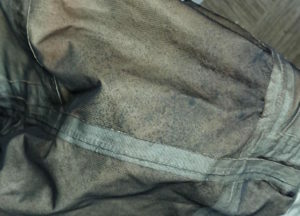 This can damage the fabric more in transit, make sure any item of clothing is fully dry before parcelling up to send in to us. Typical turnaround time for any repair or warranty claim is approximately 3 weeks from receipt. Halkon Hunt is not responsible for items lost in transit, we would recommend sending via recorded delivery. Any Other queries please email us at info@halkonhunt.com or call us on 01302 834145. Any Items received with mould & Mildew damage, as seen in photos below, sadly may not be repairable and your warranty will be void.